This Month’s Book: Boo! ¡Bu! 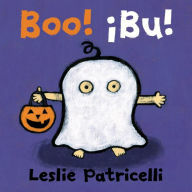 Our Cover to Cover Book of the Month for October is Boo! ¡Bu! by Leslie Patricelli. Pumpkins, Pumpkins and more pumpkins! This wonderful book will have your feeling the presence of Fall with all it’s beautiful depictions of….PUMPKINS! What is Fall without pumpkins? Play Peek-A-BOO with your child! The back and forth interactions that take place during this wonderfully simple game make it easy to have a beautiful conversation with your baby or toddler. Try using a blanket or scarf to hide behind and mimicking your child’s reactions while playing this game. Send a picture of you and your child playing Peek-A-BOO! Be creative! We can’t wait to see what you loved about !Boo ¡Bu!